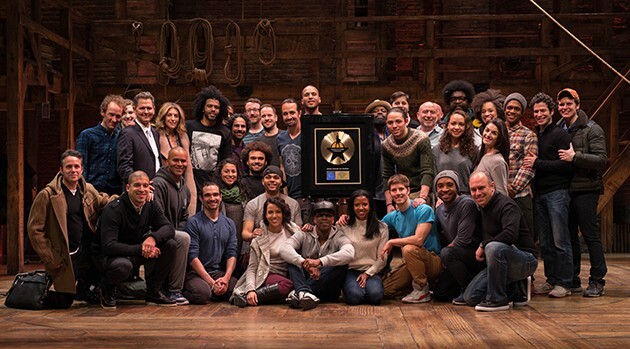 The cast of the Broadway musical Hamilton; Amanda KimThe Hamilton (Original Broadway Cast Recording) has been certified gold by the Recording Industry Association of America for streams and sales of 500,000, and Wednesday night Questlove from The Roots celebrated with the musical’s cast at the Richard Rodgers Theatre in New York City. The album was released in September 2015 and had the second biggest first-week sales ever for a cast recording, behind only Rent in 1996. Hamilton was the best-selling Broadway cast album of 2015, and became the first cast album ever to reach number one on the Billboard Rap Albums chart. This year, it won a Grammy Award for Best Musical Theater Album. A special vinyl box edition of the album will go on sale April 15.